Ever since the Magna Carta, people have had the right to petition their government for redress of their grievances. The Bill of Rights also guarantees the right of peaceable assembly to be heard. 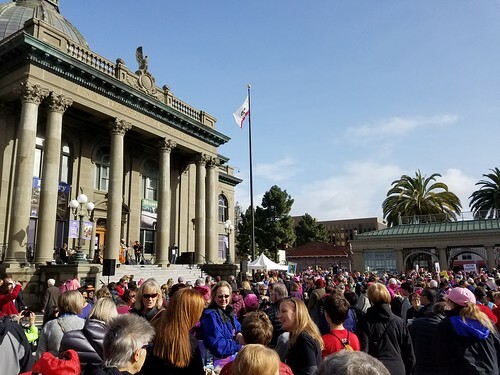 The first event I attended was in Redwood City the same day as the main Women’s marches around the country the day after the inauguration. The event was billed as a “non-partisan, multigenerational gathering” to affirm the community values under attack by the new administration. Here’s a picture of the crowd. Between the tenor of the campaign rhetoric and the direction taken during the transition, it was clear from what people were saying and what they had on their signs what things were on people’s minds: women’s issues, the secret involvement by Russia in the election, threats to foreign residents, protection of the environment, the financial entanglements of a sitting President, and above all the growing credibility gap between the public statements coming from Washington and what the public is willing to believe. 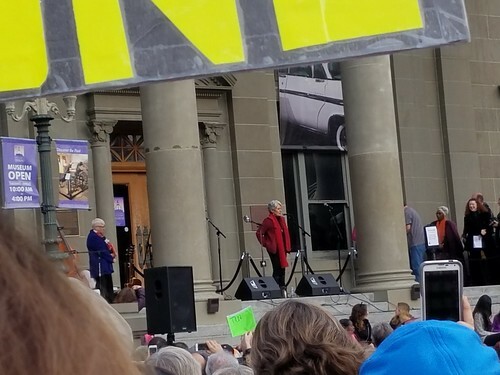 We listened to speeches from local politicians and community leaders and listened to various musicians including Joan Baez. Among other songs, she led the crowd in singing a Spanish version of “We Shall Not Moved” which the largely (but not exclusively) Anglo crowd did gamely. There were no counter-protestors and a police presence only on the margins of Courthouse Square. The atmosphere was upbeat but not celebratory, I think because of the awareness of the magnitude of the task ahead. The protest ended an hour before the San Francisco march was due to begin to give time for people to participate in both. 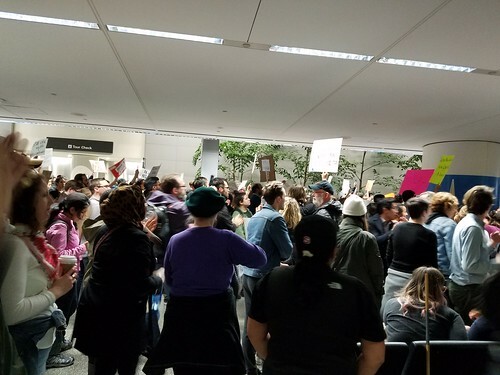 Then yesterday I saw some people mentioning the chaos caused by the Executive Order to bar the nationals of seven countries from entering the U.S., including those entering the country at San Francisco International airport. This included those people with the legal documents to be in this country (visas and in some cases green cards) who were being turned away, even separated from their families. A protest was put together to take place at the airport to petition the authorities to release these individuals and allow them access to legal representation. By the time we were able to get there, it looked like close to a thousand people were on the arrivals level of the International Terminal. There were chants and more signs and every so often a “mic check” Occupy-style to transmit information from one side of the crowed to all the rest. People were sharing their own stories and exhorting the group to stay united. Again it was peaceful, though highly charged as we heard that those being held without access to counsel were still being detained. I didn’t carry a sign, and I didn’t last week either, but I got some ideas on the kind of sign I might carry here or at other gatherings. There were lawyers there with their laptops submitting filings on behalf of the affected individuals. I had never heard so many people cheering a group of lawyers before. Lawyers! A sleeping giant has been awakened, the millions of ordinary people who know what they have seen with their own eyes and heard with their own ears and no longer can stand to watch the lies coming from our leaders and their delegates. They won’t have the luxury of dismantling the social order at their own leisure with so many people observing their every action. The sorts of places run by the autocrats Mr. Trump so admires are not lucky enough to have a population that expects to be heard when democratic norms are being destroyed. This is not normal, and so it makes sense that the response of the people doesn’t feel quite normal either. It does feel correct to me. I don’t think of myself as a leftist but more of a centrist than anything, and I suspect that a lot of the people I saw exercising their First Amendment rights might be the same. I do hope the ones with power in Washington are paying attention to this.